Scroll saws are an integral part of any tool collection, allowing you to make clean cuts and carve intricate details with extreme accuracy. The most important feature of a scroll saw it its ability to let you make very tight and accurate curved cuts. If you don't mind the analogy, whereas a jigsaw is more like a hatchet, a scroll saw is like a scalpel. You need a scroll saw to make precise, accurate cuts across a variety of surfaces. We'll start by sharing some things to keep in mind if you’re planning on buying a new model or upgrading your old one. 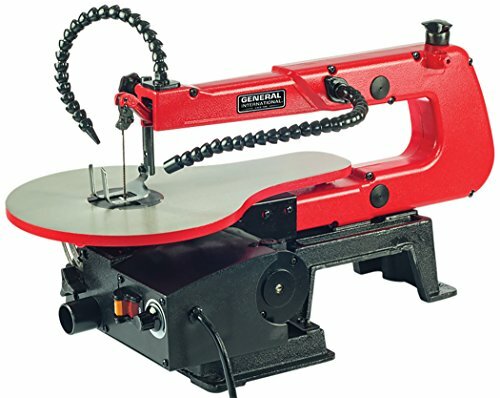 We also provide our selections for the best scroll saw available. General International Power Products 16"
​The right scrolling saw for you will depend on your specific needs and budget. 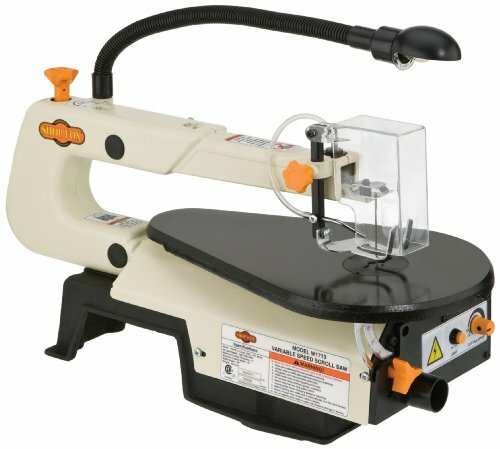 Below, we provide our comprehensive ​scroll saw reviews. Since a lot of the features depend on whether you're a beginner or more advanced user, we've broken our reviews out accordingly. You'll find our pick for a top rated cheap scroll saw, along with the best overall option. Our star rating is 1-5, and is based on the following factors: saw power, precision, versatility, and features. The Dewalt DW788 Saw is one of the best-rated scroll saws available on the market. It’s a bit pricier than other options, but it also offers speed, silence, and accuracy. The design of the Dewalt DW788 arm is the main reason for its impressive cutting capabilities. A double parallel-link arm design helps to reduce vibration and noise as you work, allowing you to create more accurate cuts.The machine’s arm is also able to move for easier operation. The arm lifts so that blades can be easily threaded through materials, allowing you to make interior cuts. It also pivots from the back of the saw to the front, minimizing movement for smoother operation. This is a large reason that the Dewalt is the highest rated scrolling saw model on our list. No cut is too tough for this saw. Professionals consistently choose this Dewalt for its extremely precise cutting capabilities. The front of the saw's liftable arm is home to its dust blower, power switch, speed adjustment panel, and blade-tensioning lever. This allows you to make necessary adjustments without having to move the machine. A tool-free blade clamp lets you change out blades quickly and easily. It takes just seconds to switch your tool in between cuts, helping you to work more efficiently. The mechanism is also stronger than in models such as the Shop Fox W1713. Unlike ​other models such as the General International Power Products or the Shop Fox W1713, the Dewalt DW788 has an oversized 20” cast iron table that’s big enough to support larger-scale projects. This saw’s table is also adjustable, beveling 45 degrees to both the left and right to make angled cuts easy from any direction. While this isn't an essential feature, it adds a lot of convenience. You're less likely to have to go grab your Mitre Saw as you do your work. Unfortunately, this table’s larger size also means that it takes up a significant portion of most standard garages. It’s also heavy as well, weighing over fifty pounds. The Dewalt DW788 Saw might not be the best choice for someone with limited floor space. No doubt - in our testing, the Dewalt DW788 is by far the best scroll saw. You'll pay a pretty penny for it, but you'll get an amazing and versatile brand and model. Like the WEN 3920, the Shop Fox W1713 Saw is another one of the top saws for scroll work that you can find on the market today. It includes variable speed control to let you cut seamlessly through different materials and accepts both pinned and pinless blades. The machine’s pinless connector can be difficult to work with, unfortunately. The mechanism can be finicky, making it difficult to change out blades. It’s also not designed to hold up as well as the rest of the saw and is prone to breaking.Fortunately, the rest of the machine is much sturdier. The arm is thick enough to withstand relatively heavy use, and the table is made of strong cast iron. Many connections that are weaker on other models are also made of heavy metal material. This is a great metal cutting saw option. If you want to hold your material in place as you work, an adjustable holding shoe allows you to secure it in place without causing any surface damage. The Shop Fox W1713 takes great care to keep your workspace clean as you cut using a two-way dust control system. A nozzle built into the machine blows sawdust away from the line or your cut, while a dust port connects to a shop vacuum to keep debris contained. The Shop Fox's table is also adjustable, with a 45-degree tilt that allows you to get more precise cuts, especially when working on fine detail. You can safely position your workspace using a lock knob. Our favorite feature of the Shop Fox is how incredibly accurate this saw is. This brand has found a way to keep the saw from vibrating very much, making your cutting quite a bit easier (and more accurate). And isn't that the whole point of the saw in the first place? The Shop Fox W1713 Saw takes great care to keep your workspace clean as you cut using a two-way dust control system. Where the Shop Fox W1713 is significantly better than the Wen 3920 is in cutting accuracy. Shop Fox does a much better job reducing vibrations while the saw is on, thus making it a lot more accurate through its cuts. In the end, both models have adequate features, but the Shop Fox excels in scroll accuracy. A nozzle built into the machine blows sawdust away from the line or your cut, while a dust port connects to a shop vacuum to keep debris contained.A gooseneck work light is included with this model so that you aren’t limited to where you can use it. You can comfortably see what you’re doing at night, in the garage, or in other dim lighting. If you can upgrade your budget, either the Shop Fox W1713 or the Dewalt DW788 make great options. However, the Dewalt is double the price of the Shop Fox, and so if you're being mindful of your budget, we'd go with the Shop Fox. As we outlined above, the Shop Fox brings with it an adequate set of features, similar to some of the other budget options we reviewed. However, for a modest increase in price, you get an incredibly high level of cutting accuracy. If you think you'll be doing a decent amount of scroll work, spend the extra money for this model, as it will pay you back in dividends. **Spoiler alert: we love this saw as a fantastic budget-consious option** As one of the best budget scroll saws, the WEN 3920 Saw offers quality and durability for a very reasonable rate. Beginners tend to appreciate its user-friendly design, while advanced carpenters like the versatility of the frame. This saw boasts a unique blade holder designed to hold both pinned and unpinned blades. You can also easily change the direction of your cut by turning pinned blades 90 degrees using a tool-free system. A removable pinless blade holder keeps blades safely in place during operation, but the locking mechanism is not the sturdiest. The blade tends to vibrate in place, and the removable unit wears out quickly. The WEN 3920 can be set to a range of speeds, from 550 to 1600 strokes per minute. 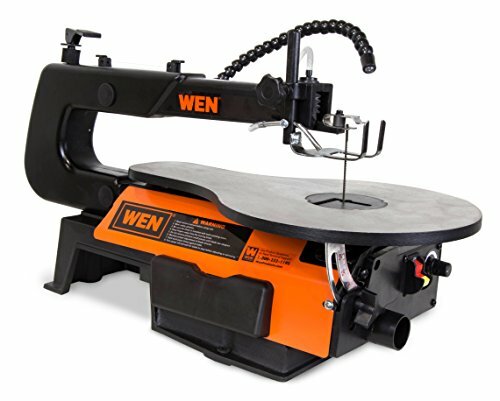 It’s easy to change the speed for different cuts using a convenient knob located on the front of the machine.The bulk of WEN’s 16” saw is fairly heavy-duty, including a stable base and a cast-iron table bevels up to 45 degrees to the left. These features make it easy to create clean, precise cuts every time. While the WEN 3920 cuts thin materials well, it isn’t able to handle anything more than 2” thick. It’s best to stick to projects that involve softer woods, plastics, and laminates. In addition to a strong base, a foot-lock clamp helps to prevent any unwanted shaking or sliding, which is really helpful. You can ensure that your materials stay in place so that every angle you cut comes out completely accurate. The WEN 3920 Saw comes with a number of additional built-in features that aren’t offered by more bare-bones models such as the Dremel Ms20. This saw includes a built-in flexible LED light to help you work in low light conditions as well as convenient onboard blade storage. We love this option as the best of cheaper scrolling saws. It's got everything you want for basic scroll work, including a sturdy, cast-iron base and a good range of variable speeds. If you’re looking for ​a top rated inexpensive scrolling saw, the ​General Intl. BT8007 is ​a standout, as it offers many of the same features as more high-end models without the price tag. You can set any speed between 400 to 1600 strokes per minute depending on your material of choice by using a dial located towards the front of the machine. That 400 SPM number is the lowest you'll find in our cheaper options, meaning that this is a great option for thicker woods where you need to go slowly. The dial is easy to access and doesn’t require you to reach around dangerous or moving parts. The General International 16” saw is compatible with both pinned and pinless blades, allowing you to work with a variety of materials. It can only cut sections u​p to 1.9" deep, however, so it’s best saved for smaller jobs. A dust collection port helps to keep the area around your workstation free of debris as you work. This not only saves you time cleaning up later on, but also helps to prevent irritation in the lungs. The port fits a standard 1¼ inch hose. If you have a dark workspace, it can be dangerous to operate power tools ​like this. The General International 16" model comes with a built-in flex-neck LED work light to allow you to work in dim lighting conditions safely. This GI saw is a fantastic entry level, budget-focused option. We love its throat size and cut depth, and it has a very low variable speed setting, making it a great option if you'll be cutting thick, hardwood. This low speed setting also makes it great for working slow, and ​makes for a great starter scrolling saw. The Dremel MS20-01 is designed to be a multi-purpose DIY tool that not only functions as a stationary saw but also detaches from its base to become a portable coping saw.A tool-free mechanism allows for quick blade changes whenever you need to make a new cut, while a convenient auto-tensioning feature keeps the blade taut and ready to operate. Variable speed control allows you to safely cut through a variety of materials without damaging your saw or its blade. The Ms20 is able to cut through wood, plastic, laminate, and a variety of metals. This scroll saw is much more lightweight and portable than others in its class, allowing you to use it just about anywhere. A fast clamp base lets you attach the unit to tables, workbenches, and other surfaces. Setup is simple, though the included directions are somewhat unclear. If you kick up dust as you work, a dust port adapter can help you to keep your workspace clean. You can prevent sawdust from building up in the air around you and getting into your eyes, nose, and throat. The Dremel MS20-01 is one of the best value scroll saws on the market. It’s a good choice for homeowners working on a budget, offering much of the quality of more expensive models such as the Shop Fox W1713 at a fraction of the price. The Ms20 has a very small throat size in comparison to the other scroll saws reviewed here. For the price, this is to be expected, and Dremel makes up for it with all of the accessories they add. Despite its lower price, the Ms20 includes several accessories in the box. In addition to the saw itself, you get an MS50 side cutting blade, four MS51 wood & plastic blades, four MS52 fine wood blades, an MS53 metal blade, and a vacuum adapter. This saw tends to work best with thin materials. The blades have difficulty making clean cuts through thick surfaces or particularly tough metals and plastics. ​The ​ three saws we reviewed all typically come in ​right around $100. For us, in our experience, the ​​WEN 3920​ is head-and-shoulders above the ​General Intl. Saw​ and the ​Dremel MS20-01​. 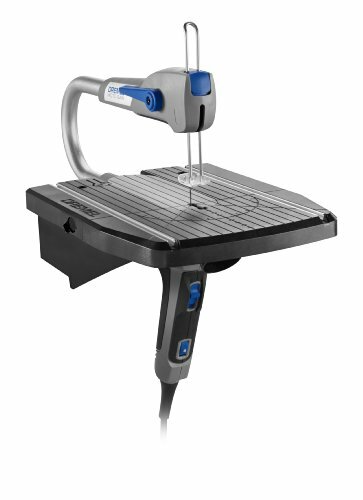 ​​The Dremel is the true entry level scroll saw. It is highly convenient and mobile, as it weights significantly less than any other saw on our list. It also converts to a coping saw, so if you're looking for convenience, then that is the only reason we recommend it. Other than that, it pales in comparison to the General Intl. and WEN. Its a closer call when comparing the General Intl. Saw ​vs WEN 3920 Saw. A slight nod goes to General Intl. for having a lower variable speed, which allows it to cut thicker woods better. However, the additional features that come with the WEN (extra blades, light, blower, etc) tip the scales. For as affordable as it is, its hard to argue against purchasing this saw, even over some of the more expensive models. ​Most people are aware of the obvious things you can use a scroll saw for: fine scroll work, such as fretwork and bookends, are perfectly suited for the fine, precise cutting capabilities that this saw is built for. Many hobbyist build Christmas ornaments, coasters, and bookends, creating ornate and intricate designs out of wood that impress all who see it. Furniture: If you're building furniture, you can use the saw for rounding out dovetails, and you can also use it for mortise-and-tenon template designs. Scrolled wood can be added to the exterior of a piece of furniture, adding an elegant and ornate look to an otherwise drab piece of furniture. Glass for Table Top: If you have a table that you would like to add glass to, a scroll saw can help you cut the glass accurately. Most notably, if the table has any curves, this saw is the perfect tool. Inlayed Pieces: We would classify this under decorative furniture, but any woodworking piece that requires inlaying can make use of the scroll saw. For example, this decorative cheese board featured below makes use of inlay. ​Marquetry: No doubt, this is sophisticated stuff. But a scroll saw is great for adding detailed cut pieces of veneer to furniture to upgrade the look and feel. Finding the best scroll saw for the money can be a challenging task. It's essential that you do your research to figure out what features you want. Here are the most important things to consider when selecting a top quality ​model. Scroll saws come in a variety of sizes, and are measured according to the maximum distance they can cut, also known as the “throat.” The throat determines how much space you have to work with, and by extension, the size of the materials that you can safely cut. It is relatively simple to figure this out once you look at the saw. You’ll see that the blade is located in the center of the work table, and that the only size restriction you have in cutting is back of the saw. The saw back is the throat, and what you use to determine size. Throat size is the distance from the blade to the back of the scroll saw. It is important because the maximum project size is twice the throat size of the ​saw you are working with. For example, a 16" scroll saw can cut a piece of wood that is 32" in length. Most homeowners only need a ​model around 15” to 20” for DIY projects. The most common size in this range is the 16” model, and will probably work just fine if you’re a beginner woodworker. You can find models up to 30” in size, but these are generally reserved for industrial settings. You really don't need anything larger than 20" ​for the vast majority of projects. If you want to go big, our advice is to look at a 20” or 21” model. It's very important that you determine what size of projects you'll be working on prior to purchasing​, as you can see. Most beginners and hobbyist use this saw for intricate cutting on small objects, so they don’t need a really large saw. Generally speaking, the scroll saw is not the saw of choice for cutting thick material. This tool works wonders at achieving intricacy and precision, but it isn’t set up for thick cuts. It’s rare to find ​one that cuts material thicker than 2”. There are several factors for this. For starters, this type of saw does not have a powerful enough motor to push through thicker material. In addition, the blade and its tensioning is not set up for thicker cuts. You’ll want to be using specific blades designed for thicker cuts. Thicker blades with larger teeth help you handle these types of cuts. If you need to make cuts thicker than 2” on a consistent basis, then you’ll probably want to look into ​a bandsaw. That saw uses a similar type of blade set up, so it can be confused with the scroll saw occasionally. The bandsaw was pretty much built for thick cuts, but lacks the precision that a scrolling saw has. Just to reiterate – thickness of cuts shouldn’t be a huge concern for you if you’re in the market for a scroll saw. The work table might seem like a bit of an after-thought​, and you might be wondering why this consideration makes it so high on our list. After all, shouldn’t the defining characteristics of a saw be in its power, accuracy, and blade make up? With regards specifically to a scroll saw, though, the work table plays a large role in its capabilities. There are three main factors that you need to consider: size, durability, and make up. For starters, the size of your table is directly related to how large of material you can cut. Your table needs to be large enough to support the material you are cutting, and you’ll want it to be large enough to allow you to comfortably work with your material without a lot of hassle. You’ll be spinning and adjusting the material quite a bit as you cut, and a small work table will continually make your life more difficult. Tables that are around 16” will be adequate, with high end models topping out at 20”. When it comes to durability, you need your work table to be reasonably heavy and made from strong material, such as cast iron. Not only does a strong material extend the life of the table, but it is able to smooth out the vibrations of the saw so you can easily work with cutting the wood. You also want the work table to be smooth, to prevent resistance while you're working. You need the material that you're handling to be able to spin freely. Aluminum or cast iron work table's are both ideal materials, and wood should be avoided. You can wax a metal table to make it easier to slide the woodwork across the table. Many of the ​top scroll saws boast tilting tables, which makes it easier to cut clean angles. The surface on most saws tilts up to 45 degrees to the left, allowing you to create bevel cuts. You can even find tables that tilt in both directions so that you can make cuts in the opposite orientation. We'll address the specifics of table tilting in another section. ​These saws are not powerful beasts… you don’t buy one for its power. With that being said, though, it’s important to pay attention to a few of the features that fall under this section. Beyond the motor, your saw needs to have adjustable speed settings and compensation for motor vibration. We’ll walk through each of the factors to look into. Like we mentioned earlier, you don’t need a ​model with a very powerful motor. These saws are designed to make highly intricate cuts, typically while tightly turning the material through detailed curves. Most decent ​models will have a motor that sits between 1.0 – 1.5 amps. We have a​n option in our review under 1.0 amps that does a decent job cutting material. However, even still, you’ll find that other saws with more powerful motors outperform it, and they don’t cost a whole lot more. The only reason you need a motor with decent power is when you combine tighter cuts on thicker materials. If you plan on pushing the limits of your saw’s cut depth capabilities, then you might want a heftier motor. With that being said, a scroll saw with a 1.2 amp motor will do great on the vast majority of material and cuts you need to make. In our opinion, the variable speed settings of the scroll are far more important than the outright power the motor brings. Your scrolling speed (the speed you push the material through the cut) will depend vary based on a variety of factors. For starters, the speed you navigate through the cuts is somewhat a matter of personal preference and experience. Keep in mind, there are really two speed considerations: how fast you “push” the material through, and how fast the scroll blade is operating. It is easy to mix them up, especially since they actually work together. Without variable speeds settings on your scroll saw, you could operate slower simply by not pushing the material through as fast. However, being able to combine your pushing efforts with a slower blade speed is significantly better, and that is why variable speed control is so important. When you’re just getting started, you’ll want to move slow through your cuts. This way, you have more control over the material and cuts, which is key to learning how the saw responds to your movements. Some woodworkers and hobbyists prefer to cut slowly, no matter what experience level they are at. You’ll have to figure out where you land in this equation as you develop in your scrolling abilities. Additionally, no matter what your experience or personal preference, different materials necessitate different speeds. Metal vs wood, thick vs thin – each requires different speeds. Being able to adjust the speed settings will allow you to be more accurate across a variety of different materials, and stay safe in doing so. All of the saws in our review have variable speed settings. Most bottom out at around 400 Strokes Per Minute (SPM), and range as high as 2,500 SPM. Make sure that the adjustment control for the speed is located near where your hands are as you operate the ​saw. While potentially a minor consideration, it is highly inconvenient to have to move your hands around when you are mid-cut to adjust the blade speed. You don’t want your scroll table to vibrate as you work through your cuts. A vibrating table makes it much more difficult to be precise about your cutting, which is exactly why you are using this saw in the first place. Lets be clear – there are a variety of factors that lead to vibration, and power​ is only one of those. However, we had to place this section somewhere, and this seemed the most relatable. The more powerful the saw motor, the more likely the saw is to have vibration… all things being equal. Many brands incorporate vibration-reduction into their motor to help minimize this, so don’t assume that a more powerful motor always means more vibration. The work table material plays a role in vibration. 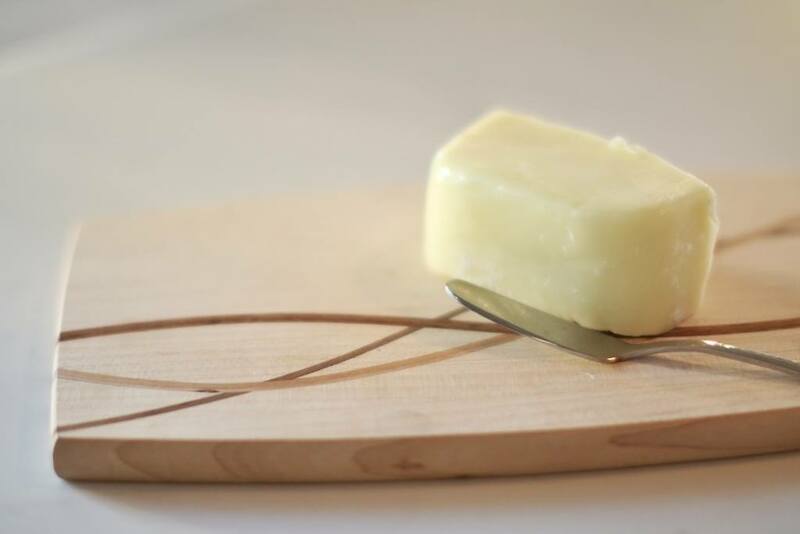 A thinner material, such as wood, will vibrate a lot more during cutting than a thicker material, such as cast iron. Yet another reason to invest in a saw with a solid work table. The scroll saw arm also plays a role. We’ll discuss arm specifics below, but know that a Double Parallel arm produces a lot less vibration than other types of arms. There is a lot of debate about whether smaller arms are better because they produce less vibration, and we’ll pick up that conversation below in more detail. One other factor, although not as influential as the others listed above, is the overall weight of the saw. A heavier ​saw will vibrate less, as there is more weight to “soak up” the motor movement. This isn’t as much of an influencer as the others listed, though. Minimizing vibration is very important and should be one of the main factors you take into consideration when purchasing. In our opinion, it is much more important than the power of the saw. When you picture a power saw, you envision loud, noisy motors that operate a high intensity. However, scroll saws do not fall into this camp. Compared to other power saws, these tools are whisper quiet, even when cutting the thickest of materials. That doesn’t mean that they don’t make any noise, though. Some saws do a better job than others at keeping quiet. While noise isn’t a big influencer in how we rate them, it is worth mentioning, especially if you are specifically focused at keeping the volume down. Double arms help to keep the noise down, as do sturdy tables. Some are just naturally quieter than others due to the style and build of their motor. Blade rocker arm (or arms) allow the scroll saw blade to move up and down. In essence, it is what is responsible for allowing you to make cuts with your saw. Some ​of these saws come with one arm, others with multiple arms. Generally speaking, more arms is better, because it helps to reduce vibrations, thus increasing accuracy. The parallel arm, or double parallel arm, replaced the rigid arm during the 1970s as the common design in scroll saws. This style of arm attaches the motor near the back of the arm to facilitate cutting. Having only one arm leads to a lot of vibrations when the saw is cutting, which is the enemy of accuracy. While you'll see a lot of budget-conscious scrolling models​ having only a single parallel arm, most of the more robust options come with a double parallel arm. A double parallel arm is exactly as it sounds... two arms sit side by side on the​ saw, and work together, thus reducing vibrations, leading to a more accurate cut. A third type of parallel arm, often referred to as the parallel link arm, incorporates rods to move arms for added accuracy. This type of arm is found in our Dewalt scroll saw review, most notably. In addition to tilting work tables, you can find saw models that offer a tilting arm. A tilting arm makes bevel cuts easier and more accurate by allowing you to keep your materials flat as you work. If you plan on doing fretwork, then you may want to consider looking into models with a top lifting arm. A lifting arm makes it easier to make interior cuts in a piece and may include a locking mechanism for convenience and safety. Most of the highest rated ​options come with a handful of additional features. In our scroll saw reviews, we outline many of these, such as lighting, dust blower, lubrication, and a stand. Scroll saws produce a decent amount of sawdust, so don't gloss over this feature. Not only do you not want to be breathing in the dust, but you don't want your shop to turn into a mess every time you use ​it. We consider some form of dust blower to be essential. There are really two ways that manufacturers provide this feature. The first is with a dust blower, which means that the sawdust created will be blown out of the cutting path. However, you will need to attach some form of dust collector to the saw in order to gather the expelled dust. The other method is more comprehensive, and some saws come with an integrated dust removal system that is complete. Some scroll saws come with a portable stand that you can set it on. This is great if you're lacking a spot in your workshop or garage to put your saw. It is also nice, because the stand is built to handle the specific ​ you're purchasing. There are some drawbacks, of course. First, you don't really know if the stand you are getting is the proper height for you to work on. Generally, ​if you are taller or shorter, you might find that the stand isn't the best height. Many also prefer to make their own stand, or place the saw on a tabletop that they already have accessible in their shop. In the end, its your call. ​Having a light on a portable, hand saw, such as the jigsaw, can be highly useful. Because of their portability, you will often be using these saws in tricky spots that don't always have great light. ​On the other hand, scroll saws aren't very portable, so chances are you'll be using them in the same place each and every time. Thus, having an on-board light isn't as essential. You can often set up lights in your shop or garage to turn on when you're using ​it. However, having a light built into the​ saw means that you don't have to worry about this. It is a nice-to-have, for sure. This also isn't much of a consideration, but worth being aware of. Some saw models are greaseless, and don't require any type of lubrication. Others come with built-in lubrication, but require you to do so every few months or years (depending on how often you use the saw). Others don't come with any form of lubrication, but do need to have grease added from time to time. As it is with so many power saws, the blade you chose for your saw is vital. While they all look the same (or similar) to the naked eye, understanding what makes each type of blade unique will ensure you get the most out of your scroll saw. ​These saws can accept either pinned or unpinned blades depending on the make and model. Pinned blades are thick and used to cut stronger materials, while unpinned (or pinless blades) can make finer cuts. Pinned blades are really not the best for detailed scroll work, and so you really need to make sure that you have a ​model that can accept unpinned blades. Those are the blade types that will allow you to do intricate cuts. The good news is that there is a much larger variety of pinless blades on the market. Much like the jigsaw, picking the right blade for your scroll saw makes all the difference in the world. There is no generic blade that will perform well for all materials and all types of cuts. Blade tensioning speaks to the area of the saw that allows you to tighten or loosen the blade. You adjust the blade tension quite a bit, almost every time you make a cut. As such, it is important to consider how easy it is to use and manipulate. In order to tighten or loosen a blade, you need to be able to reach the tensioning system, which allows you to make quick changes as needed. The knobs or levers of the system should be easily accessible to reduce your risk of accidental injury or blade breakage. If, on the other hand, the knob, cam, or lever is in a hard to reach location on the saw, you’ll be working quite a bit harder every time you use the saw. This becomes annoying very fast. Often times the tensioning is located on the back of the saw rather than on the head near the arm. While it is really up to your preference at the end of the day, we prefer when its located on the back of the saw. This came up earlier when we discussed the work table, but its important to discuss the tilt capabilities of a scroll saw in this blade section. The work table often will allow for tilting. Many only allow for single direction titling, such as to the left or to the right (although most single direction tilting is to the left). Some others will allow for multi-directional tilting, which is both left and right. Table tilt is usually 45 degrees to one side, and is often know as blade tilting instead. You might ask yourself why ​it would need to tilt, and the reason is to allow for beveled cuts. Beveled cuts, or cuts at an angle, add a whole other dimension to your scroll work. Sometimes, certain saw brands provide for tilting, but don’t put a lot of effort into it, resulting in a cut that isn’t very accurate when tilted. We’ve tried our best to identify which scroll saws aren’t as accurate for bevel cuts. Like the jigsaw, top rated scroll saws come with tool-less blade changing systems. There are several advantages to this, and frankly speaking, we wouldn’t use ​one that didn’t allow for toolless blade changing. For starters, as we’ve said many times, you’re going to be changing blades fairly frequently when doing scroll work. Tool-less blade changing makes the switch significantly faster and easier. Instead, if you end up with a saw that requires tools to change the blade, you’re faced with a much longer task. Not only does it take some time, but you need to have all of the tools on you. Loose one and there are a lot of problems. Yes, tool-less features are a convenience factor, not a necessity. But, given how often you will be utilizing it, it will dramatically speed up your work. And, lets be honest – it will also increase your enjoyment of the project. We just went on and on about how valuable we find the convenience of tool-less blade changing​. Now, when it comes to blade storage on your saw, we won’t say the same thing. The more and more scroll work you do, the more and more blades you end up with. And, storing them becomes a challenge and a hassle. Many scroll saws have solved this challenge by providing storage for blades inside the​ saw itself. Don’t get us wrong – it is really convenient to have your blades literally on your saw. But, if there is a convenience you have to sacrifice on, this isn’t a bad one to pick. ​Believe it or not, the scroll saw (in primitive form) has been around ​for 4-5 centuries, depending on who you talk to! Mind you, they were foot powered machines at the time, and massive in comparison to today's models. But none the less, the basic concept of using a reciprocating blade to make cuts has been around for quite awhile. These saws were starting to appear in shops around the country by the 1860's. The official name "scroll saw" was adopted in the early 20th century, with companies like Star, Hobbies, Lester, and Barnes manufacturing the saw. ​As you can see, there are quite a few features to examine and look into when you are evaluating scroll saws. Our scroll saw reviews help you analyze what is important, so you don't have to do all the deep, time-intensive digging yourself. If you’ve been thinking about purchasing a new scroll saw, now might be the time. We hope our expert advice can help to guide your search and lead you to the perfect saw to add to your garage.